Workers prepare to lift the sunken Sewol ferry (center) in waters off Jindo, South Korea, March 23, 2017. The 6,800-ton South Korean ferry emerged from the water Thursday, nearly three years after it capsized and sank into violent seas off the country's southwestern coast. An extensive South Korean salvage operation Thursday successfully raised the Sewol ferry, which capsized nearly three years ago, killing more than 300 passengers, many of them high school students. “At 4:47am we lifted (the Sewol) 22 meters and entire body of the ferry started to show for the first time above the surface,” said Lee Cheol-jo, an official in charge of salvage operation with the Ministry of Oceans and Fisheries. FILE - Maritime police search for missing passengers in front of the South Korean ferry Sewol, which sank at the sea off Jindo April 16, 2014. The sinking of the Sewol, with 476 passengers on board, during a routine journey from Incheon to the holiday resort of Jeju Island, April 16, 2014, triggered national outrage over the deadly accident that was later determined to be caused in part by greed, incompetence and negligence. The ferry on that day was dangerously overloaded, hauling 3,608 tons of cargo despite a maximum cargo limit of 987 tons. It’s excessive weight made the vessel less stable, and it capsized while attempting to execute a turn at a high speed. Many of the 250 teenagers, who died while on a school trip, were instructed by crewmembers to remain in their cabin, even as the crew abandoned ship. The ship’s captain Lee Joon-seok, who also abandoned ship, was later convicted of gross negligence and sentenced to life in prison, while 14 other crew members were sentenced to up to 12 years in prison for abandonment and violating maritime law. 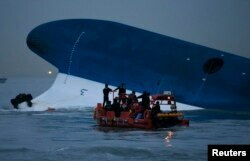 The South Korean coast guard’s slow and indecisive rescue efforts also came under criticism. Officers later claimed they lacked the proper training and equipment to mount such a large-scale rescue effort at sea. FILE - People watch a live television program showing South Korean President Park Geun-hye's speech to the nation regarding the sunken ferry Sewol at the Seoul Train Station in Seoul, South Korea, May 19, 2014. And public confidence in the government of then-President Park Geun-hye plummeted, and never recovered, over her perceived ineffective management of the crisis, and her own mysterious disappearance when she made no public statement or appearance for seven hours while the ferry was sinking. The South Korean National Assembly cited Park’s negligence in handling the Sewol disaster, along with her alleged connection to a multimillion-dollar bribery scandal, when it voted to impeach the president in December. The Constitutional Court recently upheld the impeachment motion and a new presidential election is scheduled for May 9. Barges are seen during a salvage operation of sunken ferry Sewol at the sea off Jindo, South Korea, March 22, 2017. Families of the Sewol victims have been calling for the ship to be raised and for a more thorough investigation into the disaster. The Sewol sunk in the Yellow Sea near the southeastern Island of Jindo. The salvage efforts to recover the 6,800 ton ferry had been delayed in part because of rough conditions at sea and complicated by requirements set to bring up the vessel intact, so as to aid the investigation into the cause of the accident, and to preserve any bodies that may still be on board. Nine victims are still unaccounted for. A Chinese salvage company fitted 33 beams beneath the hull and used 66 hydraulic jacks to raise the hull of the ship, which was lying on its left side at a depth of 40 meters below the sea. The recovered vessel will soon be moved to the nearby port of Mokpo on the mainland. “We are calculating that it will take about 12 to 13 days to move the ferry to dry dock of Mokpo port,” said Lee with the Ministry of Oceans and Fisheries. 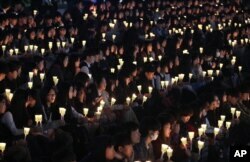 FILE - High school students hold candles to pay their respects to the victims of the sunken ferry Sewol during a ceremony on the eve of the second anniversary of the ferry sinking in Ansan, South Korea, April 15, 2016. The group also wants more government transparency and participation by opposition parties and victim’s families in the investigation process.